Still using Excel to manage your organization? Excel is great – if only one person has to use the file. But sharing an Excel file with multiple users is a pain. And if any of them makes even one tiny mistake, the whole structure can be fouled up. If this argument is making sense to you, please read on – I may be able to help. is created exactly the way you want it, and can grow and change with your organization’s needs? Click the tabs to the right to see some examples. 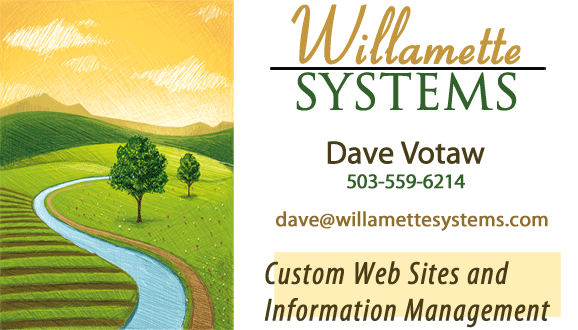 I created a Volunteer Management System for Salem Free Clinic. Volunteers (who provide free medical services to uninsured people) use my online system to sign up for clinic times in specific roles, for which they have been pre-qualified. I wrote a system called CaN Center Attendance Tracker for Salem Leadership Foundation. It’s in use by over a dozen different churches to track attendance for all sorts of community outreach programs. Salem Leadership Foundation uses the information from CaNCAT to report back to its various funding sources about the way their money is being put to use. send reminder notices to those who have signed up? I wrote a system for Salem Alliance church a few years ago that allowed church members to schedule music & drama groups in their homes for Christmas parties. The groups, dates and times were preset; when people went online to schedule them, the group received a printed calendar of all of their booking times and locations. I created a custom site for my fantasy baseball league. We have unique rules, so no commercial system would work. The league ran on spreadsheets, distributed by email, for many years, but now the team owners can call up the latest information online at any time, just like the commercial systems. They can set up their lineups as well. We even have a real-time draft system!